Hello welcome to my blog! Feel free to look around...and try my recipes! Bring tone to cooking and seep love from your heart into the food. This gives it a mystical taste and form that ignites the soul. HAPPY COOKING!!! Mash the cooked potatoes, add little butter and the other ingredients (exept flour, breadcrumbs and egg). 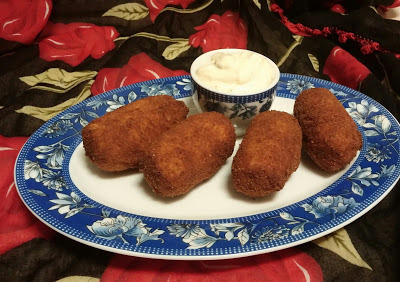 Make croquettes shapes. Cover with flour, then egg and last in breadcrumbs. Fry them in hot oil. Lemon Mayonnaise: Stir 5 tablespoons of mayonnaise with 2 teaspoons fresh lemon zest and a few drops of lemon juice.